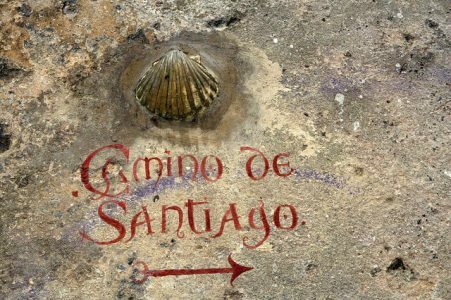 The Big Daddy of all pilgrimages is “The Camino,” also known as the Way of St. James, which is actually several trails that begin in Spain, Portugal and France and end in the city of Santiago de Compostela on the northwestern coast of Spain. In this third in our 5-part series “The 21st Century Pilgrim,“ I describe five Tours of the Camino de Santiago that will enable everyone, and especially culture vultures, to experience this once-in-a-lifetime, transformative adventure. According to legend, in the 9th century, the remains of the apostle Saint James were carried by boat from Jerusalem to Spain, where he was buried, and some of his bones ended up at the Cathedral of Santiago de Compostela, a three-towered, Romanesque extravaganza. Pilgrims in the Middle Ages trod the long, hard Way of St. James from throughout the continent in order to earn plenary indulgences, and some people still do. Today, thousands of travelers walk (some ride bikes or horses) the Camino to Santiago de Compostela for various other reasons. Nowadays, Camino walkers are not so much religious pilgrims as bucket list checkers; mid-life seekers of life’s purpose; young hikers on their gap years, and those commemorating a milestone in their lives. 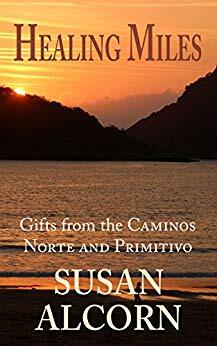 My friend, Susan Alcorn, who is a prolific author and journalist specializing in the Camino and in active travel, embarked on a Camino walk as a way of combating health issues and worries about her aging mother. Her book, Healing Miles: Gifts from the Caminos Norte and Primitivo, traces 750 miles through cities and remote villages, along beaches and up mountains; along the way, she and her husband took time out to visit historic sites and to enjoy tapas, vino tinto, pulpo(octopus), and sidra (hard cider); solitude, contemplation, and much camaraderie. (One of the top advantages of walking the Camino is meeting, and sometimes making life-long friends of, walkers from around the world. Everyone has a story!) In Healing Miles, you’ll also find invaluable information and tips for the trek on two main Camino routes. The oldest trail, about 340K, the Camino Primitivo begins in Oviedo, in northern Spain, joining up with the French Way towards the end. Camino Portugués, the Portuguese Way, starts at either Lisbon (about 610K) or Porto (about 227K), crossing five beautiful rivers in Portugal. Camino del Norte, the Northern Way, is a rather more challenging trail that usually begins in the Basque city of Irun or in San Sebastián, then follows the coastline of northern Spain and heads inland towards Santi, joining the Camino Francés at Arzúa. A dependable, long-established tour operator specializing in walking vacations, The Wayfarers offers week-long tours of the Camino de Santiago including guides, meals, some transport, and first-class accommodations. Beginning in Burgos, the small group heads to the Cruz de Hierro village of O’Cebreiro, then on to the ancient town of Astorga, with its Roman walls, medieval cathedral and Gaudi’s eccentric Bishop’s Palace. On the itinerary are the mountain villages of Rabanal del Camino and O’Cebreiro, and Ponferrada, with its 12th-century Templar castle built to defend the pilgrims from the Moors. Each day’s walk is 5-6 hours, covering 9-15 miles of moderate walking, and transport is at hand when needed. The grande finale of The Wayfarers tour is a pilgrims’ mass in the cathedral. Even if you’re not religious, this is a heart-warming experience. One of the top biking and walking tour companies in the world, Butterfield guides bicyclers from Leon to Santiago de Compostela on a scenic route that includes Astorga, Castrillo de los Polvazares, and Cruz de Ferro, descending to Ponferrada and the Castle of the Knights Templar, then rising to the mountaintop town of O’Cebreiro. On the last day, cyclers head for the rugged coast of Galicia to Finisterre for a refreshing seafood lunch before heading back to the city for a final exploration. A self-guided walking tour with lodging, most meals, and gear transport included makes the Camino doable for those who want the experience without the physical wear-and-tear. Peregrine does all the heavy lifting and handle the logistics for you on week-long, quite affordable, 100K walking tours of the Camino de Santiago, from Sarria to Santiago (airport transfer, too). To receive the official Credencial del Paregrino, you must have traveled at least the last 100K (200K for cyclists) and have your Camino “passport” stamped along your route. You can pick up a credential, which is a booklet, at your first stop, which may be a parish church, a pilgrim’s hostel, and at some monasteries, cathedrals, hotels, town halls and other places. The easiest way to get one in advance is through “American Pilgrims on the Camino”. Their website is a fabulous font of information and research; they also publish a newsletter, and they have local chapters and hold meetings throughout the U.S. Even if you never walk the Camino, this is fascinating stuff on the website of the official pilgrim’s reception office at the cathedral. The Camino Ways travel agency will arrange all or part of your Camino adventure, from flights to tour companies to self-guided itineraries. They KNOW, as shown on their information-rich website. TheCamino.com/au This website sells an excellent paperback/digital guidebook to the Camino Francés, gives you a day-by-day suggested itinerary, and answers the most common questions that would-be hikers may have. For more than four decades, OAT has provided small group, guided tours for active, culture-oriented, life-long learners over the age of 50. Their repeat clientele is legendary, so you’ll need to book early, even for 2019. The two-week “Northern Spain & Portugal Pilgrimage Into the Past” features plenty of time to explore ancient cities and villages. Transport is provided between destinations, and although this is not a traditional on-foot-only Camino pilgrimage, plenty of walking is on the itinerary, as is an optional three-mile walk on the Camino into the city of Santiago de Compostela. You can also add on the pre-trip to Carcassonne and Bayonne, and/or the post-trip to Lisbon. 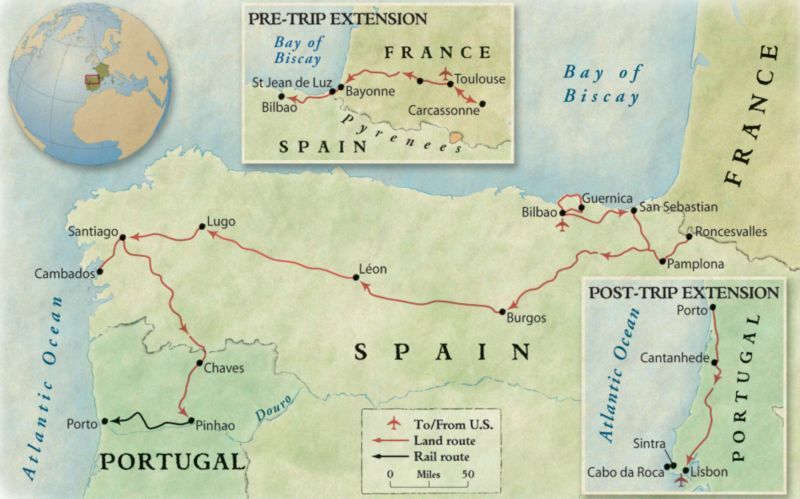 The Camino itinerary on the Boundless Journeys website lays out an easy-to-moderate walking tour from Bilbao to Santiago de Compostela, with no more than 3-4 hours of walking a day on sections of the French Way trail. This is a guided expedition with a “sag wagon” for when you just can’t walk another step! Cultural attractions in each town are on the daily itineraries; and, meals, transport and lodging are included. Grand Arrival at Santiago de Compostela ! 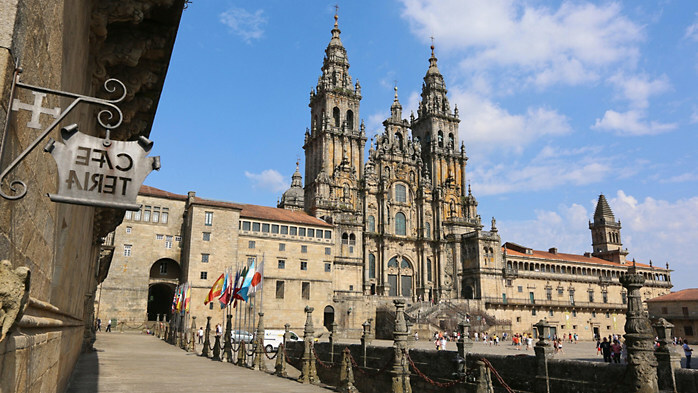 At the end of their Camino walks, pilgrims wander through the beautiful city of Santiago de Compostela to the Plaza del Obradoiro and walk up the steps of the dazzling Romanesque-style cathedral, a UNESCO World Heritage site, within which are said to lie some of the remains of St. James. Here they burst into tears, celebrate, attend a pilgrim’s mass, and most important, they hand in their Camino “passport” and receive an official Credencial del Paregrino! Trace Your Irish or Scottish Ancestry: find your roots at family history centers and on guided genealogy tours. What is your passion when it comes to travel? History? Cuisine? Music? Art? Ancestry? Have you been on a trip or a tour that became a real pilgrimage for you?